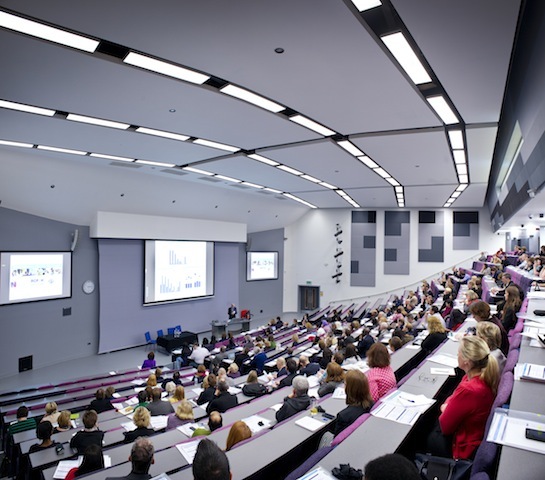 The University of Manchester Conferences and Venues offers a choice of great value and diverse venues for 4 to 1000, stretching across 4 campuses, from city centre to out of town locations, enabling us to tailor facilities to exact requirements and budgets. The city centre campus includes the Renold building with lecture theatres seating up to 524, together with 20 classrooms, exhibition area and accommodation within walking distance. On the same site, Manchester Meeting Place and Barnes Wallis building provide dedicated day meeting facilities year round for 6 to 250 people. The wider campus facilities include University Place, with a 1000 seat auditorium, plus 23 seminar rooms, a 300 seat restaurant, 500 square metre exhibition space and adjacent marquee area. Chancellors Hotel and Conference Centre is a dedicated year round venue for meetings for up to 125 and 3 star accommodation for 70 guests. We also have 3000 bedrooms available in the summer vacation within our halls of residence which also offer meeting rooms throughout the year. Other services include full conference administration and a hotel booking agency and with dedicated event managers at each venue supported by an inhouse a/v and IT team, you can be assured of a successful event. Contact The University Of Manchester Conference and Venues directly or use our simple contact form.